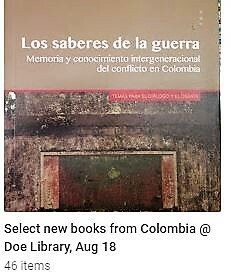 I wanted to present our readers with some selected images of the new books that came in today from Colombia and Cuba. I will leave up to the readers to browse through the albums and enjoy what we are collecting for our general collections in these two countries. Both countries and their publishing represent distinct trajectories and historical circumstances and it can be seen in the images of the books that we purchase. 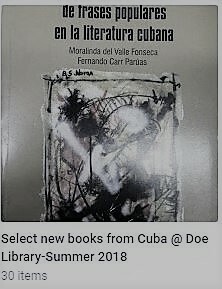 While the editorial and censorial works that happen in some countries cannot be represented in their full capacities, as an academic librarian, I usually collect the books that would be of interest to our students, faculty and visiting scholars. The library and its collections cannot be an archive of sorts. However, the contemporary library collections can purvey the anticipated needs of its users. Please click on the title of each country or on the icons after the name of the countries.